How much does it cost to travel to Dublin? How much money will you need in Dublin? €104 ($117) is the average daily price for traveling in Dublin. The average price of food for one day is €33 ($37). The average price of a hotel for a couple is €108 ($121). Additional pricing is in the table below. These average travel prices have been collected from other travelers to help you plan your own travel budget. How much money do I need for Dublin? Dublin is the vibrant and fun capital city of Ireland and home to over a third of the country's population. There are almost 2 million people in the metropolitan area. It's also the most common entry point into the country for visitors. Once you arrive, its a good idea to head over to the main tourist office in St. Andrew's Church off Grafton Street. They can give you maps and information to make sure your trip is efficient and fun. Many people enjoy seeing what remains of the Georgian architecture throughout the city. Much of the city is also modernist in style with many blocks made up of offices. Dublin has a mild climate due to the influence of the Atlantic Ocean and the Gulf Stream. It rains less than you might expect, but a light shower may occur on most days. Winters are milder than you would think with temperature typically staying around 5 degrees Celsius. Frost is common between the months of November and February because nighttime temperatures do fall below freezing. It snows occasionally, but not often. Summers are mild or may even be considered cool, and temperatures typically don't get much above 20 degrees Celsius. There are many sights spread throughout Dublin. During the peak travel months they can get crowded so make sure you arrive early. Some interesting places to visit include Chester Beatty Library, Christ Church Cathedral, St Patrick's Cathedral, Dublin Castle, Dublin Writers Museum, the Dublin Zoo, Dublinia & the Viking World, the General Post Office, Merrion Square, the National Botanical Gardens and the National Museum of Ireland, among other places. Dublin has many different neighborhoods that each have their own vibe. 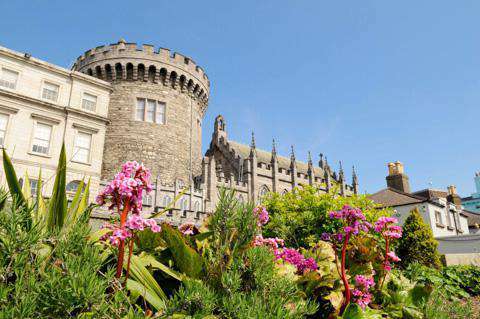 The Old City is where you will find the Dublin Castle and the remaining remnants of the city's original walls. There are also many shops and boutiques there. Temple Bar is the party center for the city and there are many bars and clubs. Trinity College Area has a traditional university vibe with many bookstores and shops. The Guinness Brewery is in Liberties, and most of the hotels, restaurants and shops are in St. Stephen's Green and the Grafton Street Area. Fitzwilliam & Merrion Squares are surrounded by Georgian town houses and O'Connell Street has many hotels and some good restaurants. Other notable neighborhoods include North Quays and Ballsbridge/Embassy Row. If you're tired of looking a museums and attractions, there are many activities you can enjoy in Dublin. Consider going to a hurling, Gaelic football, or rugby game. Home games for the Leinster Rugby team are usually played at the RDS Arena. Both hurling and Gaelic football is played at Croke Park Stadium. Another fun option is to take a self guided tour of the Guinness Storehouse. There's an exhibition that travels from the ground floor to the seventh floor. For the price of entry you also get a pint of Guinness. Plenty more attractions and things to do can be found in the Irish countryside outside of Dublin, such as castles, pastoral landscapes, and natural scenery like the Cliffs of Moher. Check out this guide to choosing a great day trip from Dublin. Restaurant food can be expensive in Dublin, but the quality is also generally high. If you're looking for some budget options, head to the Indian restaurants around the South William Street area that runs parallel to Grafton Street. If you arrive early you can often take advantage of an "early bird" special. Three courses usually are included in the special and prices are around 10 euros. Lunches in this area can also be cheap. Other interesting and affordable restaurants can be found on Parnell Street in Dublin 1. Here you will find a concentration of Chinese and Asian restaurants. Another cheap meal option is to try the local fish and chips. There are several good places around town where you can try this local favorite. For more information, see What to Eat in Ireland. Public transportation in Dublin is not as good as that of most larger European cities. It continues to improve though, and as a tourist you are likely to spend most of your time walking around the city center anyway. There is a tram or light rail system (the Luas) that is generally good and reliable and can be used it to get around the city center. It has two lines that do not connect, but you can walk between them in 15 minutes at their closest point. The red line runs from Connolly Railway Station and the Point Theatre to the suburb of Tallaght. The green line runs from St. Stephen's Green to Bride's Glen in Cherrywood. The DART is a suburban rail service that follows the coast between Greystones in the south and Howth and Malahide in the north. There are four additional suburban rail lines that travel around Dublin. The state run bus service travels through the city and its suburbs and even goes into the very outer suburbs. With over 200 routes, the numbering system can get confusing. It is best to find a route map, find your stop, and then look at the final destination which is displayed on the front of the bus. Also, check out these free things to do in Dublin. There are many, many places to shop in Dublin. The most well known shopping street is Grafton Street, which is a pedestrian only street that travels between St. Stephen's Green and Trinity College. On Grafton Street is Brown Thomas, a very expensive department store selling everything from cloths to jewelry to photographs. Just off of that street you'll find The Powerscourt Centre, which is a very impressive shopping center located in a restored 18th century townhouse.